Kolkata is notorious for its traffic, with the number of vehicles on its roads increasing each year. Two-wheelers not only account for a significant percentage of the number of vehicles in Kolkata, they also account for the most number of road accident deaths in the city. A two-wheeler insurance can help offset some of the damages one suffers in such accidents. Failure to insure your two-wheeler can result in fines, with the fine for first-time offenders being Rs.400, which can increase to Rs.1,000 subsequently. *The aforementioned list highlights only the popular options in Kolkata, and does not rank them in any specific order. Insurance providers aim to simplify the entire process related to getting a vehicle fixed after an accident. Paying for damages from one’s own pocket can be frustrating, which has made the concept of cashless garages extremely popular. Insurers have a network of garages across the country where one can get a vehicle fixed without having to pay them. The bill is settled directly by the insurer, subject to a certain limit. Locating a cashless garage of a particular insurer is simple, with a number of ways to find them. One can log onto the official website of their motor insurance provider and use the locator option to find the closest garage. The brochure/policy document could contain a list of network garages in Kolkata. One could also contact the customer care service to figure out the closest network garage. Choosing to get your vehicle fixed at a network garage which offers cashless facilities can be a boon, offering some great benefits. Hassle-free – Going to get a bike fixed at a normal garage can be a hassle. This, however, can be avoided at network garages. One only has to intimate the insurer and provide the relevant documents. The insurer will get in touch with the garage to complete all formalities. Assured quality – A local garage could replace damaged parts with duplicates/used spares. These can result in breakdowns in the future. The worry of riding a bike with duplicate parts is eliminated when one gets the vehicle fixed at a network garage. These garages have a reputation of using quality spares. Additionally, one can also be assured that the work is not shoddy or incomplete. Quick – The time to fix a bike at a network garage is typically faster when compared to normal garages. This is primarily because the tie-up between the garage and the insurer removes all impediments which one can face otherwise. Replacement vehicle – Certain insurers offer replacement vehicles while a damaged motorbike is getting fixed at a network garage. No out-of-pocket payment - The biggest benefit of opting for cashless garages is that one needn’t pay a huge chunk of money out of their own pocket. This reduces their financial burden, albeit one might be expected to pay an amount if the cost of damages exceeds the cover provided. Given the number of insurance options available, it is possible for one to get confused and choose an insurance policy which doesn’t meet their expectations. There are a number of factors which one should keep in mind before buying the policy. 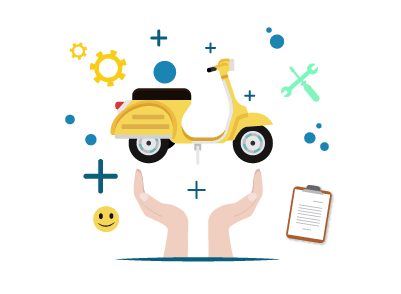 Premium – Owning a two-wheeler comes with its own set of expenses, with the cost of purchasing an insurance policy adding to it. One should do a thorough comparison of the products on offer, choosing a policy whose premium doesn’t dent one’s account balance. The premium varies based on the age of vehicle, make, model & engine capacity of bike, city where it is registered, etc. Tenure – Most two-wheeler insurance policies are annually renewable. However, one can also opt for long-term policies with a period of 2/3 years. A longer period results in lower premiums, helping one save money. Also, there could be instances where one forgets to renew an annual policy before the expiry date. This could result in no protection to the vehicle. Policy type – The government has made it mandatory to have a third-party liability cover for every two-wheeler in the country. However, this offers limited protection. One can opt for a comprehensive cover which could be a better option, given the number of bike related accidents occurring each day. Discounts – Most insurers offer discounts on premiums, especially if one chooses a long-term two-wheeler policy. This could help save a considerable amount each year. The No-Claim Bonus should be checked, for this can reduce the premium amount by as much as 50%. Policy inclusions/exclusions – Each policy has a predefined set of incidents which are covered. Ensure that the inclusions take care of any eventuality which could arise. Similarly, exclusions could dilute the protection offered by the policy. Careful attention should be paid to both factors while choosing a plan. Claims process – Any incident involving damage to the bike/injury to an individual can be stressful. A complicated claims process can increase the stress. Choosing an insurance provider with a simple and efficient claims process can alleviate the stress, resulting in quicker claim settlement. The market for second hand bikes is huge in India, with thousands of such vehicles sold each day. Selling a two-wheeler without transferring the insurance policy in the name of the new owner could lead to complications in case of a claim. The insurance provider can refuse to acknowledge any claim in such cases. It therefore becomes critical to transfer the policy to the new owner. This can be done by following a few basic steps. Intimate the insurer about sale of bike. A new proposal form should be filled and submitted, with proof of sale. This includes the Registration Certificate (RC). Provide a copy of the old policy to the insurer. Official change of ownership could take time on account of getting details registered at the regional transport office (RTO). One will have to submit the RC to the insurer once formalities are completed by the RTO. The insurer will transfer the insurance to the new owner once these formalities are completed.